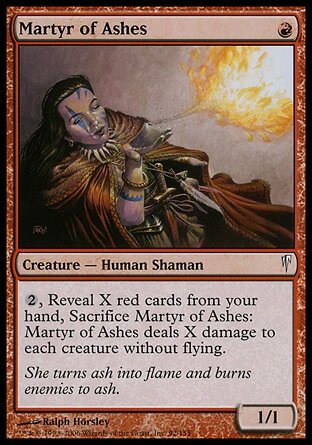 The Martyr cycle will remind anyone who played with Urza's block cards of a couple cycles from that. These ones, however, just don't cut it. The Cinder Sage and Scent of Cinder were great directed removal. This is just a tremor on steroids. Mind you, the effect plays nice with holding cards in hand, but since when does red want to hold back and play defense. Red in Coldsnap already seems a big underpowered, and this guy doesn't do much to shake that reputation. I like this guy in limited - he's a short order board reset, if you can go mono or heavy red. I know others don't like him, since I can pick it up very late pick, but eh. I've 2, 3 and 4 for 1'd many times with this. In constructed, I wonder if it would be any good against White Weenie as a board wiper - probably not...? It's drawback is that it doesn't hurt flyers...if it did, it could be good. The red member of the Martyr cycle, this one has possibly the most powerful of all of them. For really cheap, and giving the opponent a peek at your hand, you get a semi-earthquake ability. In limited this can be really good since mass removal of any kind can at least be considered usable, but only if you get enough red cards to reveal for this card. However, I don't see this card making the cut for Standard. Most red decks will have their hands empty from all the burn, so I don't think you'd have the cards to reveal to its ability. Casual: 2 - It's a fun board-wiper. Limited: 3 - You have to get enough red cards to abuse it, but it's still good.